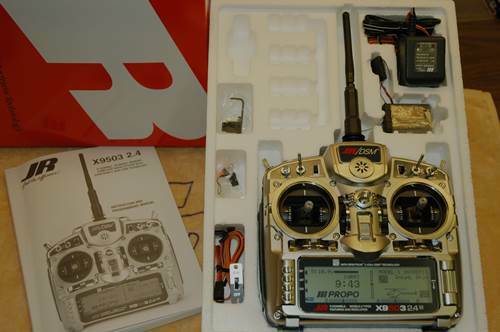 RC radios (also called "RC Transmitters & RC Controllers") are at the very heart of our hobby. The radio is the single most important piece of equipment you will own in this hobby. After all, without a radio – there is no radio control. The radio basically puts you (or at least your commands) inside your model aircraft. 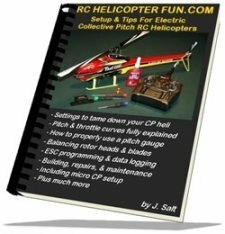 In short, one radio for everything plus computerized radios are the only option if you want to correctly setup your collective pitch heli - again why they are so important. Please take your time deciding on your RC Radio system. Unlike your heli, plane, or quad copter; you never crash your radio. It's with you for the long haul and is therefore worth investing a little time and money in. Without question, RC radios have changed more over the years than just about every other RC component. Better performance, more versatility, feature rich, and the best news... RC radios cost less now than they ever have. 2010's Fully computerized & infinitely customizable 2.4 GHz spread spectrum 16 channel with real time telemetry, voice alert, fast processor, large memory, and high resolution color display. I actually feel a bit ill (I know I am not the only one) when I think of what I have spent on some of my RC radios over the years. Most are all obsolete now. Even the one computerized 2.4 GHz radio that I purchased not all that long ago is showing its age now due to switch programming limitations and lack of voice alert and telemetry. I've enjoyed flying with all of them over the past 30+ years, but the features just keep getting better and better while the cost per feature ratio continues to drop. For those of you who are just getting into radio control – you don’t know just how lucky you are. I admit, I'm envious of the number of choices now open to you for the high performance & low cost outlay. 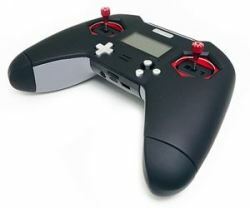 Shown here for example is a Game Pad inspired computerized RC radio which is a new & popular chioce with quadrotor pilots. Not what I would like to fly with, but that's the beauty of RC flight right now - there is something for everyone! 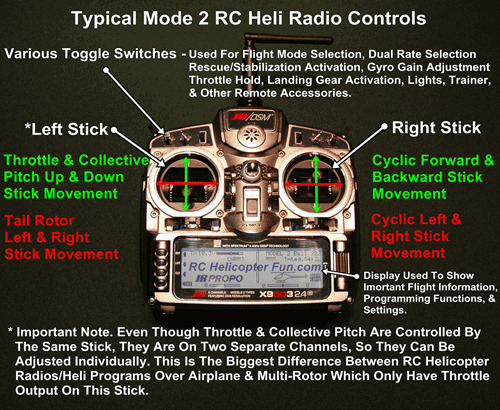 Before we start getting into specifics, let’s first look at how an RC radio actually controls a radio controlled aircraft – specifically a helicopter. Let's Watch How This RC Radio Works In The Video Below. The radio/transmitter is what you hold and use to control the aircraft with two joysticks, switches, and knobs. Computerized radios will also have an LCD display screen with additional switches, dials, or touch screen for choosing and entering data. This "programming" allows you to "customize" how the computerized radio operates, what different switches do, and change channel output values for given stick or switch input values. Basically you are tuning the radio performance to your own performance level and what "feels" best to you and you alone. The receiver, receiver battery, and servos are all inside your RC model. The receiver as the name suggests, receives the radio signals (RF) from the transmitter by way of 2.4 GHz antennas. It then processes and converts these radio signals into electrical PWM (pulse width modulation) signals the servos, or other electronic control components on-board the aircraft understand. The servos are small electrical/mechanical devices that convert the electrical PWM signals from the receiver back into mechanical movement to physically move the control surfaces on the aircraft. I have an depth page on servos that dives deep into their operation. 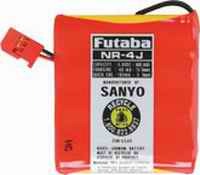 If you fly smaller electric RC helicopters or airplanes, you will generally not require a dedicated receiver battery pack or switch harness. Most electric RC speed controllers that are used to control the motor speed of the heli or airplane also provide a regulated voltage output to power the receiver, servos, and gyro. This is done by something called the BEC (battery eliminator circuit) for the obvious reason it eliminates the need for a separate RX battery. In effect, the BEC is tapping into some of the power from the main battery pack and conditioning that voltage to run your on-board radio system. No receiver battery pack results in a substantial weight savings, and the small amount of power that is used by the on board radio systems is negligible compared to the many amps the motor draws. Larger electric models may have dedicated receiver battery packs since there is so much load already placed on the main battery pack from the very high amperage loads drawn from the motor not to mention the high current loads that full size digital servos draw in larger models that can be more than the BEC can adequately output. For these reasons, many people (myself included) like having a separate RX battery pack on larger electrics because it generally gives you a more robust power source from your on-board electronics over sharing the power with the main flight battery. I wouldn't hesitate to say that so many of the so called "radio brand crash excuses" are/were caused primarily by voltage supply issues to the electronic components on-board the aircraft. That said, higher power, quality BEC's are now available and successfully being used in larger electric RC helicopters. Pretty basic right... The RC radio converts the movement from your hands into radio signals that are transmitted though the antenna on the radio. These radio signals are then received by the receiver antenna and processed into an electrical PWM signal and sent to the servos. The servos understand this signal and convert it back into movement – just as if you were inside your model. This movement is proportional – in other words, if you only move the transmitter stick 30% on your radio, the servo will only move 30% (assuming you have no exponential or dual rates enabled). 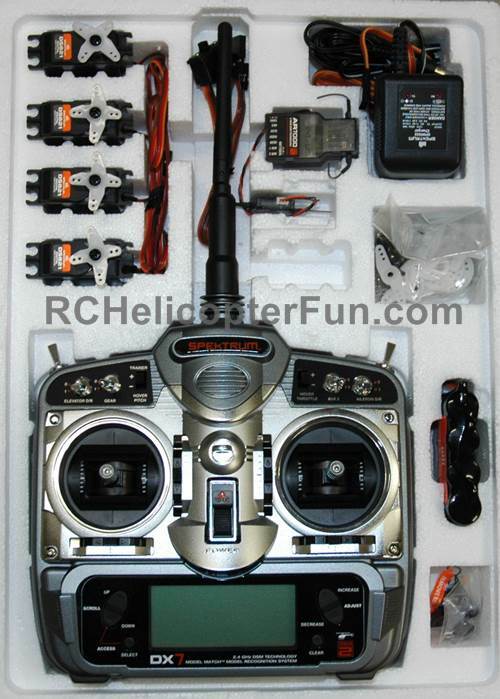 This is the very distinct difference in quality hobby grade RC radios over inexpensive RC toys. Most inexpensive RC toys don’t use proportional RC control; the signals are either on or off – full movement or no movement. It would be impossible to control any RC aircraft without the precise small and variable control movements provided by proportional commands. The other big difference between hobby grade RC radios and a toy RC radio is the transmitter's power output. With hobby grade you get more transmitting power and you will lose sight of your RC model long before you are out of radio range. I get this exact question a lot when flying... “how far away can you control it”. If you can see it – you can control it is the answer. With so many RC radio systems on the market, and so many features, how do you know what radio system is right for you? 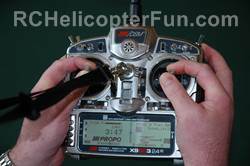 Just like choosing your best RC helicopter , choosing your best RC radio requires information and some research. Brand (Futaba, FrSky, Spektrum, Jeti, Graupner, etc). How Many Channels (2,3,4,5,6,7, or more). What Type of Modulation (AM, FM, PCM, 2.4GHz Spread Spectrum Modulation. Helicopter Specific Features such as: CCPM Modes, Throttle & Pitch Curves, Tail Rotor Compensation (also called revolution mixing), Remote Gyro Gain Adjustment, Throttle Hold, Idle Up, Flight Modes. Other Important Features: LCD Displays, Digital Trims, Exponential Rates, Dual Rates, Model Memory, Telemetry, Servo Reversing, Servo Travel Adjustment, Voice Alert, Programmable Switches. 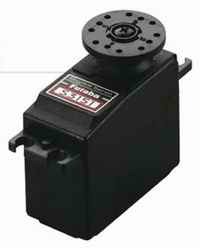 Type of Servos (analog, digital / standard, micro / speed, torque). 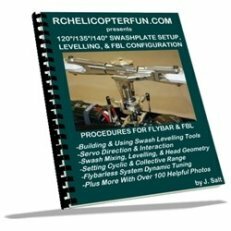 Some flybarless systems double as the receiver these days so you have to make sure your radio system is compatible with the flybarless system, at least if you want to take full advantage of this feature. Mode 1, 2, 3, or 4. So much to decide on and understand! Relax - with radio systems these days, this list has been greatly simplified because most good computerized radios now come standard with many of the features listed above, modes can easily be changed, and technology has eliminated or made many of these features obsolete. As I said before, the very best news is that the new radio systems of today come with all these standard features at very reasonable prices. You can basically get an entry level 6 channel computerized 2.4GHz radio with all the bells and whistles, way better performance and reliability for less than a very basic 4 channel AM airplane radio cost 30 years ago – wow! 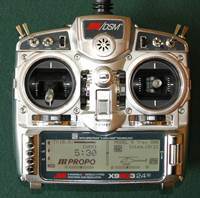 Sure, there are a few high end hobby grade radios out there that cost over $1000.00 USD, but most average weekend pilots who fly RC helicopters, airplanes, and multi-rotors will be spending in the $150.00 to $600.00 range on radio gear. This will give you a superb quality computerized radio system with all the features that most people will ever need or use, and only newer technology will end up dating the radio. The other great thing about computerized radios is you can use one radio for many different model aircraft. While this was partially true in the past, most of us had several radios because re-configuring your radio setup for each RC model was a pain in the rear end, plus there were helicopter specific radios and airplane specific radios if you flew both types of aircraft. With today's computerized radios, each RC model can be configured into the radio’s memory and it's a simple mater of choosing what model you are flying by just scrolling through the list you have programmed into the radio. Helicopters, airplanes, gliders, and quad/multi-rotor; one single computerized RC radio can handle all your RC models. "Do you use your thumbs or fingers & thumbs to move the radio sticks" is a question I get asked fairly often. Myself, I fly all "Thumbs". I find I have the very best stick control with thumb only flying plus I have my forefingers free for all the toggle switches and the AUX 3 & 4 side dials on the side of this radio or back of some other radios. Just because I fly all thumbs doesn't make it the only way of course. Lots of people like the "Pinch" method where the sticks are held between the forefinger and thumb. Some find this allows for more precise stick control. Perhaps my hands are just too small as I can't even move the sticks to their full limits of throw when I try to fly "pinch". I also don't like the fact I can't toggle switches as easy or the back/side dials. In the end, there is no right or wrong way. Try both to see what you feel most comfortable with and gives you the smoothest stick control. Pinch It or Thumb It - totally up to the individual. 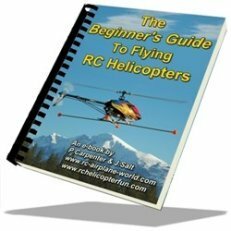 Here is the best advice and recommendations I can give you regarding RC radios - primarily if you are serious about getting into the hobby and sticking with it. Get a name brand computerized radio system that uses 2.4 GHz spread spectrum modulation. Why name brand when you can get cheap no-name/copied and the like for about half the price? Well, over and above superior warranties and customer support in almost all cases; the primary meat & potato reasons boil down to 100% system compatibility, long term growth and enjoyment, resale value, and build quality. That "name brand" link above by the way really dives into the main RC radio brands out there so you can get a better idea of what each has to offer, and goes into more detail on how to choose. Yes, if you are really not that serious about the hobby yet, an inexpensive knockoff radio or whatever you wish call it will work fine for the little bit of time you will end up using it - no question. What happens however when you get a larger bird, or want to get a specific flybarless system, or want to sell the radio or aircraft down the road if it uses an obscure radio system? These are all things to think about & consider in your decision. Getting a decent name brand system to start with should be seen as a time & money saving investment toward your success in the hobby. You will have a powerful tool that provides features and freedoms that you will appreciate every time you fly – beginner to pro – your radio will become your best flying partner. 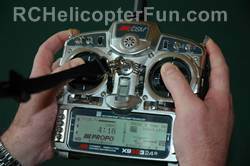 Spektrum RC Radios for example are very popular in the helicopter side of RC these days since so many flybarless systems are Spektrum Satellite RX compatible, and they are sold at most hobby shops world wide. This "popularity" is nice for newbies since you can easily get help should you need it. All but the basic DX6e have "voice alert" which is such a useful feature I find. Over and above that, so many RC heli pilots fly with Spektrum gear making resale of equipment generally both easier, and more desirable. Here are links to what I consider to be four solid Spektrum RC radio choices to start with depending on your budget and how many channels you need (6,8,& 9); starting with the entry level DX6e up to the DX9. These of course are not the only good computerized radios out there to start on; but if I was just getting into the hobby, they are the ones I would gravitate towards myself. Spektrum is also what I usually recommend to friends who are just getting into the hobby for the simple fact they are so popular, pretty easy for beginners to understand in a short time frame, and easy to get help with, both locally and online. Is One RC Radio Brand Better Than The Rest? The manufacturer's would sure like you to think so; but there is simply no hard data to support claims like that. Here is a link to a really good RC Spread Spectrum Demystified article that addresses this and shows that all the major brands use the same basic 2.4 GHz DSSS & FHSS spread spectrum technology and it all works well. I maintain that most of the so called "brand" weaknesses that get reported in rants are due to inadequate receiver powering methods, or restarts to either the RX or FBL system cause by static discharge. Once again, it's component and build quality of the radio plus the features you like or the way the radio feels in your hand that makes one brand or model better for you. Sticking with the big name brands generally assures you get that build & component quality.